For a long time, we have been familiar with the name of Roland which is reputed for producing some awesome electronic and dance music making equipment. All through the past 30 years or so, we have come across some fantastic machines ranging from powerful analog synthesizers to popular TR style drum machines to some creative digital synth technological innovations of our time. The color scheme is red and black featuring a sleek front panel; however, the Roland JDXI can also boast of outstanding metallic plastic sides. The front panel consists of as many as 15 robust knobs which are able to send or receive MIDI, along with translucent rubber buttons which make it appear really sturdy. You won’t feel any difficulty in reading the red LCD which transmits lots of onboard parameters perfectly well in spite of its compact size. Nevertheless, given that there are so many parameters and functions concealed in the menus, there is undoubtedly a lot of cursor or button pressing by the user. Fortunately, it is feasible to scroll in tens and directly go to the editing sections while pressing shift along with the incremental buttons; however, it is expected that Ronald makes an update by adding an alternate value dial mode for the knob. Firstly, it is essential to visualize the Roland JDXI as a compact keyboard which is definitely impressive when it comes to its price. In fact, it is much more formidable than it can be thought initially and you will get a fair amount of features for less than €500, which is undoubtedly astounding. The Roland JDXI is a robust synthesizer in spite of the über-plastic casing and the inexpensive-looking buttons and encoders. As a matter of fact, there are as many as 128 digital voices which are shared in between a couple of PCM-based digital synths and a drum part as well as one analog voice that makes a total of 129 voices across 4 parts. The users can make use of the Menu button for having accessibility to lots of editing options in order to dial in intricate sound creations. The Roland JDXI actually behaves like an audio or MIDI interface by means of only one USB 2 connection. It is required to go to the company’s website and download the required driver to make it run. However, do not forget to download the most recent firmware update since it will be able to fix the bugs and also provide you with quite a few useful enhancements. In case you want to connect the Roland JDXI with your audio interface, it is possible to do so by means of a couple of 1/4-inch output jacks. Apart from this, you will also come across an extra headphone output. It is quite gratifying to see that Roland did not go for any 1/8-inch connection. When it comes to the input side, such as the Novation MiniNova or the MicroKorg, the Roland JDXI features an XLR microphone for the onboard vocoder. There is also an extra 1/4-inch mono input which switches in between guitar settings and line. It is also feasible to use the Auto Note function or the Vocoder on either the guitar or the line in or mic input. Next, we will talk about the sound engines. The Roland JDXI is actually a 4-part multitimbral – a drum part, a couple of digital parts and also a monophonic analog part which is receiving or outputting on different MIDI channels and every single part comes with a corresponding sequencer track. You will come across as many as 64 analog presets, 256 digital presets along with 32 drum kits with 256 user spaces. Although the analog engine might seem quite contemporary and stylish, yet it is definitely Roland-y. Each of the digital components happens to be 64-note polyphonic and the Roland JDXI surprisingly accommodates a complete Ronald synth engine having an editing depth of almost the same as that of the FA series and this is definitely a good news at this affordable price! The quality of sound is quite okay and comparable with the other more expensive products of the company while the character is hi-fi as well as engaging. Every single digital component is quite robust and within a program which enables you to have a tone with 3 partials so that you’re able to layer a PCM piano together with Supernatural brass and strings for each digital component. However, we need to admit the fact that there isn’t any complex multi-sampled piano sound or even any keyboard split sound which is usually found on the FA series; yet the integrated sounds or sequences are quite decent (extremely Dance oriented) and also the PCM samples are quite usable. Moreover, you can also add a few more from the Axial library. The programmers will be gratified since there is adequate tweakability such as an A/D pitch envelope, editable amp/filter envelopes, a separate modulation, some remarkable digital filters, and also general purpose LFO for every partial along with key trigger, fade and so forth. It is hard to believe that all these features are available for a £500 synth. Because of its small size, only several real-time knobs are found in this product; however, the company has selected them smartly with controls for pulse width, filter, effect/amp levels, LFO (with as many as 3 destinations), and an intelligent amp envelope dial which provides you with long releases or short delays to the left, slow attacks or longer releases to the right and punchy sounds at the center. Besides this, the envelopes are also quite snappy. Kits with 2 sounds for every key is allowed by the versatile drum part which comes with labels for the drum type on top of every key. The interesting thing here is that it is possible for you to have a different envelope, filter, effect, volume, pan and pitch level for each key. The preset kits come with some reliable samples of classic drum machines from the company and even more, such as different percussion sounds, noises, and vocal samples, while there is no question about the quality of the 453 onboard drum waves. Next, we’ll talk about the analog part. We have been informed by the company that there is 1 TVF analog filter, 1 DCO analog oscillator (along with Sub Osc), and 1 TVA analog amplifier, while the LFOs and envelopes are digital. The more important thing is that the analog engine sounds rather contemporary and stylish that promises a great deal for the forthcoming JD-XA poly. Thus it can be easily asserted that the versatility, features and sound quality of the awesome Roland JDXI is truly unrivaled at its present cost. It is possible to listen to some stepping while you slowly turn the filter cut-off (although only at a very high resonance configuration); however, the triangle, saw, and the pulse waves are punchy, rich and full and the character, in general, is warm, precise and present which can even compete with the quality of other costly analog monos out there. The Roland JDXI definitely reminds us of an outdated Juno-106 sonically, which is also a nice thing. Besides this, although it is not possible to detune the primary analog osc against the sub-oscillator, there is the PWM available to you that can help to add movement or detuning. The analog LPF sounds which are ladder-based are definitely awesome and can generate refined lows, speaker-shaking subs, blistering highs, and sensational squelches. Just like the drum parts, you can route the analog part through the effects and it is really a gift of God having such great features with this product. However, there is one drawback and that is the fact that it is not possible to route the digital components by the analog filter or even layer them together with the analog synth excepting while sequencing; nevertheless, while adding in the audio/MIDI interface and the sequencer, you still realize the fact that the Roland JDXI is definitely a worthwhile synthesizer having virtually all the required features at such a low price. 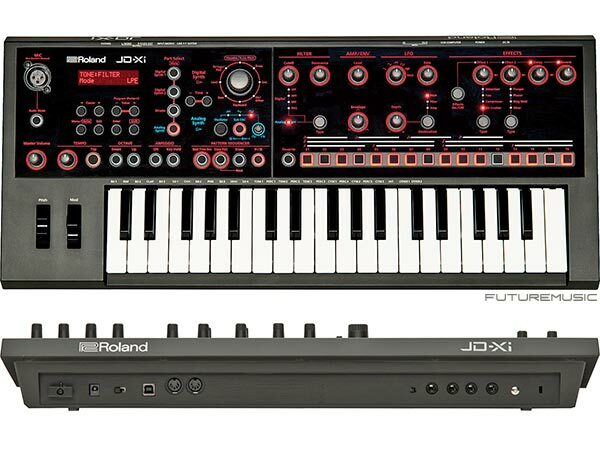 This revolutionary Roland JDXI has, in fact, made a huge impact in the synth world! It has got virtually everything which can be desired by the live performers, studio producers and analog heads for an extremely small outlay in a robust and portable form. In spite of having a few minor drawbacks, most of them are quite tweakable in the OS updates and the main thing is that the versatility, features and sound quality of the product are definitely outstanding. While it is absolutely inspiring to compose and perform with the Roland JDXI, all of the controls which you require for live or studio tweaking are present onboard and the concept of “crossover” is undoubtedly creative. There is a saying that you should not judge a book by looking at its cover. Similarly, it is quite natural for you to think about this product to be quite simple by looking at its controls. It can be mentioned here that the controls which are offered by the front panel are quite simple. For instance, there is only one knob which has to control a perimeter labeled envelope and the same can be said about the other four onboard effects. However, if you inspect further by looking at the menus and the submenus of the plethora of the editable parameters, your idea will soon change. The users will gain access to lots of editing options by simply pressing the Menu button which will help them to dial in intricate sound creations. Right here you will come across a huge number of programming options including effects, tone, pattern scale and much more. The user interface of the Roland JD XI is surprisingly understaffed for such a comprehensive synth engine. It reminds us of programming any outdated FM gear having a few features such as a small window, some menu buttons, and cursor control. In order to transform itself into an awesome dance production powerhouse, this synthesizer requires a software editor along with an inbuilt graphics interface. The powerful drum section happens to be one of the most important features of the Roland JDXI. In fact, they sound rather punchy and great. It is possible to select between any of the reputed TR machines plus an abundance of genera-specific kits. Every single voice has as much as 4 wave generators along with an extra 453 wave generators to pick from. This is really awesome! Every single drum voice is accessible to its own filter as well as effects configurations. This implies that the users are able to shape every single drum voice separately. This amazing synthesizer comes with a couple of outstanding digital synth sections. You may select between any one of the 256 presets which are based on categories like Strings/Pads, Brass, FX/Other, Bass, Keyboard, Seq, Lead, and Vocoder. Besides the rather simple Filter, LFO, Envelope and 1 knob effect adjustments, you have to press some navigation buttons for having access to the vast programming features. Both these synth sections consist of as many as 3 layered tones which can be individually edited. It is also possible to sculpt these sections even further by any of the 7 different filters and/or amp, pitch or filter envelopes. Outstanding synth/drum equipment at a very inexpensive cost. Advanced idea sketchpad and hybrid instrument which is more powerful than they appear. Real-time recording, parameter automation, and step sequencing. Helpful components, patches and presets for EDM production. It is not battery-operated and also there is no aftertouch. The product is in need of a software editor. The analog synth gets disabled by the usage of the vocoder. It is difficult to distinguish red on black text in low light. As you go deeper, you will learn to appreciate this compact unit much more. In fact, there are plenty of things going on under the hood and this product is really worth your money considering the fact that you will get so many features at such a low cost. Thus, it can be rightly asserted that the amazing Roland JDXI is a perfect companion for live performance because of its straightforward connectivity, versatility as well as abundant sound variety.